The first thing I thought when little Leila appeared was just how much she looked like Christie. I don’t know if the producers cast a doppelganger on purpose or not, it almost looked as though the actress playing the youngest sister (Tyler Brown) was called in to fill the spot of Leila due to another actress pulling out or something. Bit of a shitter this, as I spent most of the first hour thinking how similar they were and indeed, if this new child was her or not. This diluted the atmosphere slightly – not great. 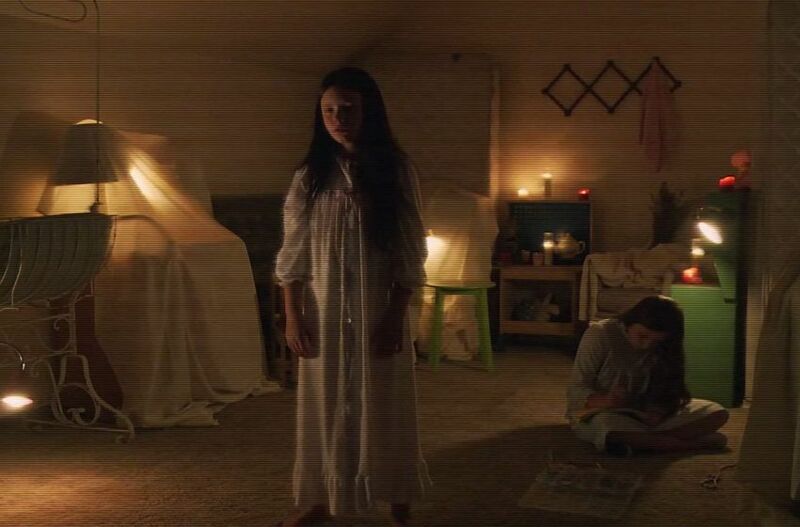 Katie and Christie (the young versions) appear a few times, only briefly, as Ryan watches more and more of the tapes he finds in his house. But the movie then becomes more of a mystery than a horror as he tries to work out what the girls are doing and why. 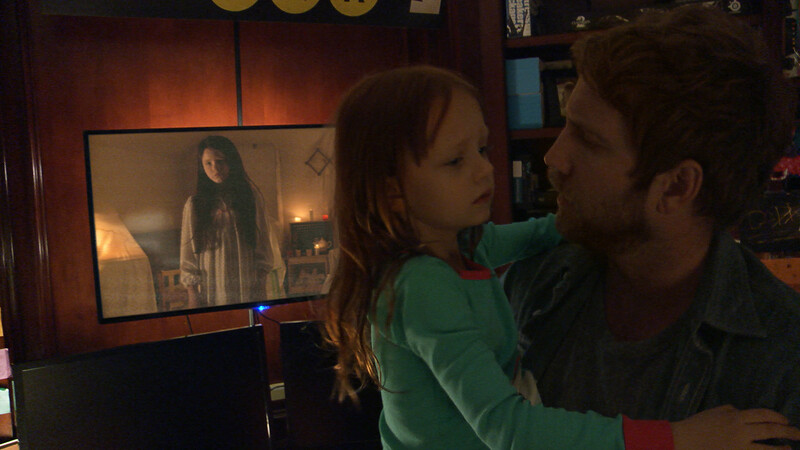 Scenes you’d expect to contain a few decent jumps actually don’t and in reverse, Paranormal Activity: The Ghost Dimension becomes flat. Empty. And nowhere near as full of scares as one or two of its earlier installments. As with many horror flicks where the parents or other responsible adults remain totally oblivious to the spooky going’s-on affecting the younger child, couple Ryan and Emily spend a good first hour of the movie being complete dumbass parents; the classic ‘he plays footage back but manages to miss the ghost on screen by turning it off before it appears, she doesn’t believe a word he says. Even when she witnesses activity herself, she doesn’t believe him and passes it off as his imagination. 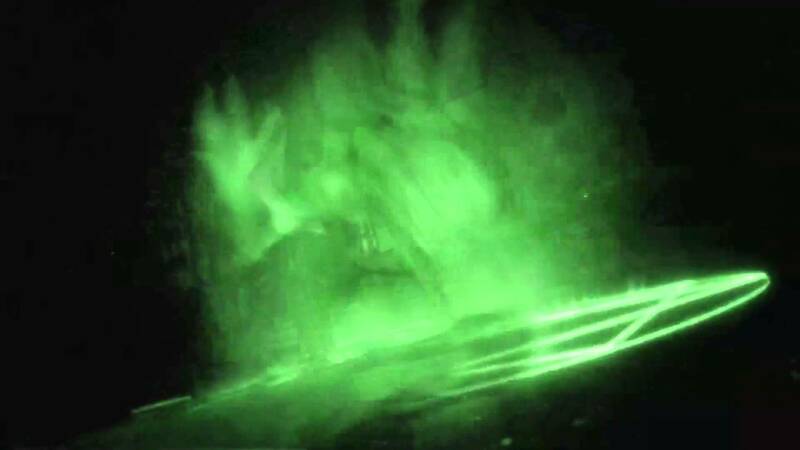 Of course, when the couple do finally accept that the misty image on screen (actually shaped like a human body) is not just dust and a paranormal entity, the movie picks up. I hated one scene – due to how cringeworthingly oblivious the father was. 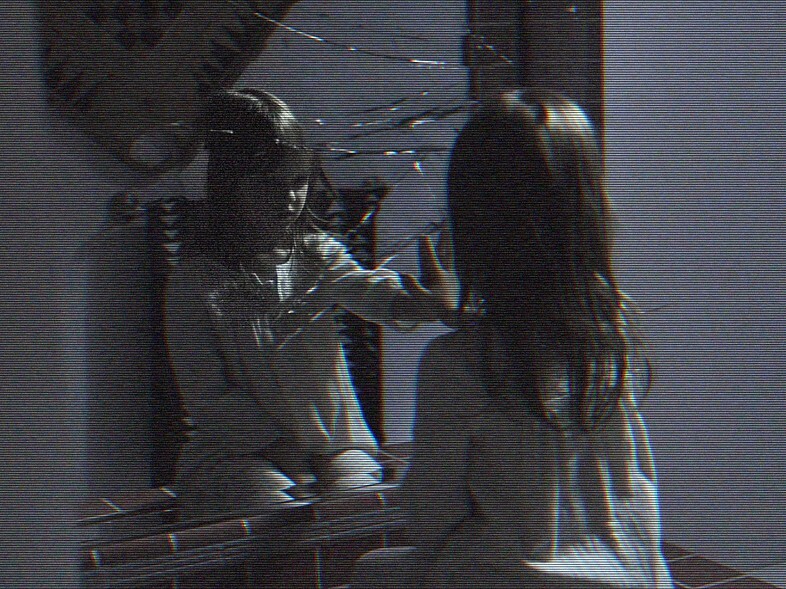 When Leila is found touching a mirror and making contact with the entity, her father enters the room and pulls her away. When they have left the room, a ghostly hand presses against the other side of the mirror and the glass cracks. The mirror actually breaks. 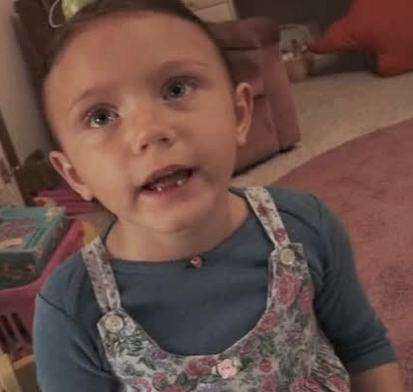 And yet the following scene where her father watches the footage back sees him never witness this occurance. Ryan either switches it off before it happens, or just doesn’t notice a large mirror being smashed. I wanted the movie to hurry up and end. 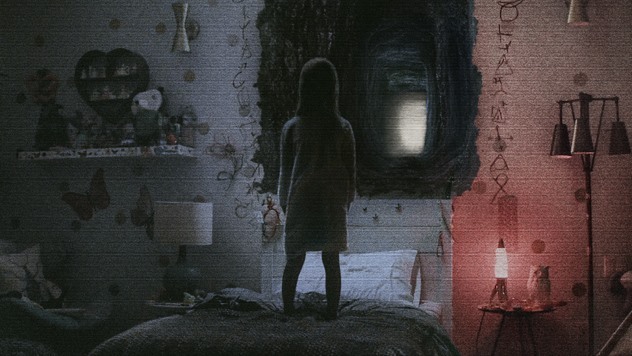 On the plus side, the visuals used throughout Paranormal Activity: The Ghost Dimension were not overly bad. 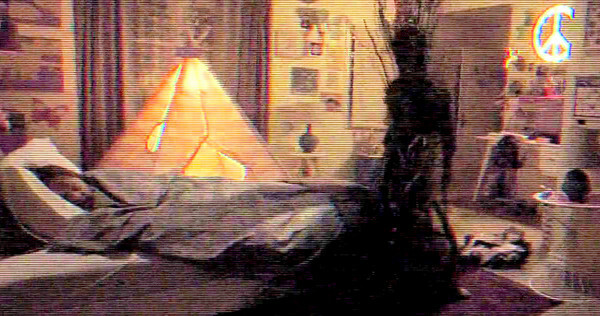 The actual entity (Toby) was displayed by the producers using a load of black, wriggly stuff. Whenever it was around there were strange specks of chunky dust (first time I’ve described dust as chunky) which morphed into a mound of squiggly black stuff. It ripples down from the ceiling or stems from the floor into the shape of a deformed body, which I actually found quite creepy, a little fascinating. I sat watching the screen intensely, wondering what would happen next, so visually, this movie did good and provided some entertaining moments. The final few moments of the movie see Leila disappear into the realm, Emily going after her, and Toby becoming human. Yes – the paranormal entity who has been wreaking havoc for more than five movies finally steps into the feet of a human body. The finale involves Emily stepping through a portal and time travelling through different house locations to try and rescue her daughter. Sadly she doesn’t quite make it..
After the little girl announces that it’s all over, a pair of manly legs walk into focus. The actor playing the character got an easy ride as viewers only get to see his legs. Yes, you’re treated to a nice bit of calf as Toby stomps around the screen doing the nasty on Emily. And that’s it. Six films later and Toby is human. Bit of a long wait, but it happened. And he doesn’t leave quietly – he takes Leila with him as he walks out of the room. I did have one burning question during this final moment – what now? Are the Santa Rosa police going to scour the local area for demon sightings? Put a Missing Persons advert out for Leila with something in the description like, “brown hair, three foot tall, may be accompanied by a demon”? Toby’s going to have one hell of an interview at the passport office that’s all I can say. So will Oren Peli and Jason Blum leave it here? Or will they go even further with ‘Paranormal Activity 6: Trying to Fit In With the Neighbours’..? 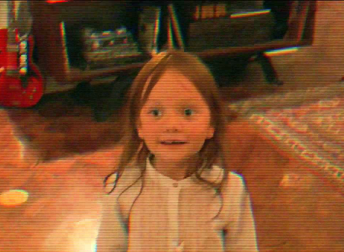 The upside to Paranormal Activity: The Ghost Dimension is that – like a few of its earlier installments – it creates a nice tension through use of anticipation. The classic date stamps appear (Night #2 8th December 2004, for example) which signify something may be about to happen. I liked this, as every time one popped up I took it as almost a warning to brace myself for whatever might be coming – and it splits the movie up nicely. There were a few jumps but defintely nowhere near as many as the first and third movies where they were pretty consistent. 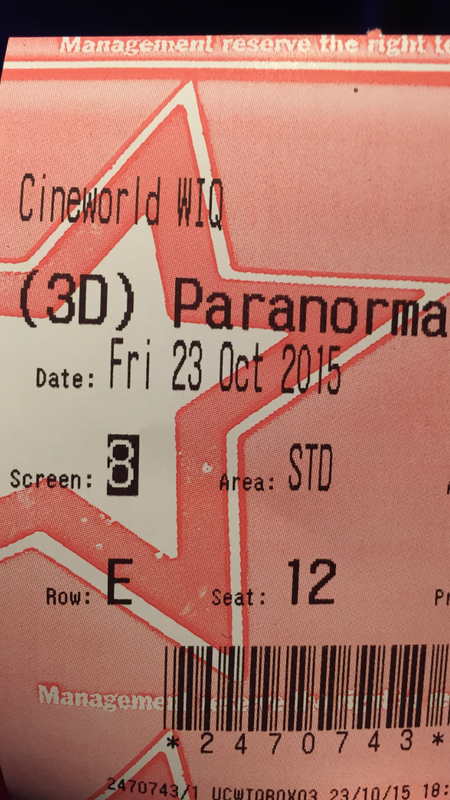 The downside to Paranormal Activity: Ghost Dimension is its flat storyline. It’s basically 70% ‘puzzled father watches video tapes and tries enthusiastically to get others to watch them’, 30% paranormal entity entering girl’s bedroom late at night. This movie focuses purely on Ryan’s tapes and Leila’s visits whilst in bed, going back and forth so sporadically that it loses its way slightly and becomes a bit boring. It were only the scares / anticipation of scares that kept me awake. Give it a go if you’ve seen all the others. You might as well. Sums this movie up perfectly actually.. “might as well”. Just don’t pay good money to see it. 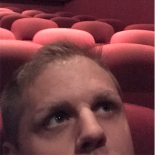 This entry was posted on November 4, 2015 by rickysfilmreviews.